Multihulls have never been more popular. In-water boat shows now dedicate huge amounts of space to them and sailors are interested in them for more than just chartering. Sailors who want to spend a lot of time on their boats also want comfort and few monohulls can compete with the space, layout opportunities and flat-hull sailing found in a catamaran. And although the entry price point for a multihull is usually significantly higher, the increase in supply means picking up a catamaran on the used-boat market with an eye to doing a bit of work on it is more realistic than ever. Although many catamarans are designed with the charter market in mind, translating to bulletproof boats that can sleep a cast of thousands, there are several multihull manufacturers who have long-term and liveaboard cruisers in mind right from the drawing board. The Manta 42 falls into a sweet spot of good looks (let’s be honest, some multihulls make sacrifices in the looks department), cruising comfort and excellent performance. The original Manta 38 was designed in 1993 and went into production in 1996, updated to 40 and then later to 42 feet. In 2002 the 42-foot boat was redesigned as the MkII. The result is a boat with better fit-and-finish, more headroom and lots of little improvements developed over 15 years of building boats. I looked around at a number of 42 MkIIs that varied in condition, equipment and layout. The basic structure of the boat is stock, but the interior can be customized by the building owner. The boat I ultimately chose, a 2003 model, was setup for a cruising couple. The main area of the boat held the galley, nav station and saloon. The port hull is setup as the owner’s suite. In the aft end of the hull there is a queen berth and dressing area, midship there is storage, and forward a head with an enclosed shower stall. The starboard hull is more of a utility space, with the aft end housing a double guest cabin and more storage amidships. The boat cost $285,300—a hefty price tag, but one that is to be expected for a larger multihull. Like most multihulls on the used market, the boat had been cruised all over the Caribbean, so I knew the first budgetary priority would be sails. Strong tradewinds and constant exposure to damaging ultraviolet rays take a toll on sails, so a new jib and mainsail were called for. 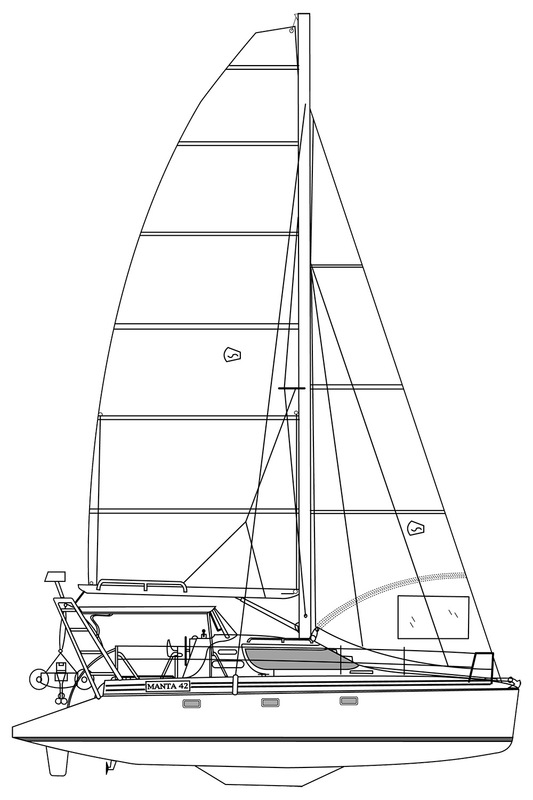 Catamarans, and the Manta in particular, get a lot of drive from a big mainsail. Tom Pease from North Sails Midwest recommended a full-batten main created from bulletproof 10.3-ounce NorDac Dacron. Five full battens should give the sail nice shape and the design includes two reef points, an over-the-top leech cord to the leech tension at the gooseneck, a cunningham attachment and three draft stripes. The sail cost $5,100. The boat has an interesting mainsail sheeting system. Technically there is no mainsheet, rather the boom is sheeted with a 20-to-1 boom vang. Since catamarans don’t sail well hard on the wind, the arrangement works well. The line in the vang was a little tired, we replaced it with a new length of New England Ropes Sta-Set. The new line cost us $350. The boat has a hardtop bimini that you can climb up onto when folding the mainsail, but this is far from an ideal situation. I wanted an efficient way to deal with the very large and heavy new mainsail that wouldn’t make me think twice about setting it. Lazyjacks are one option but a sail pack cover where the sail drops right into it, is even better. The cover cost $1,200 and was worth every dime. The Manta has a unique, and somewhat old-school, jib setup. It uses a 98% hanked-on jib with what is essentially a jib boom. They riffed the traditional jib boom into a concept called a camber spar, a stainless steel jib boom that fits into a pocket in the sail. The camber spar serves as a jib boom and a full shaped batten. The jib is self-tending and you can fly it downwind without a whisker pole. North Sails built us a new jib and it perfectly accommodated the camber spar. A hanked-on jib is a little inconvenient, but it does yield one nice benefit: you drop the sail into a foredeck bag and hang another sail above it. Catamarans need some headsail to punch upwind in a blow, but even a 98% sail can be too big at times. I had a small but very heavily built sail made for $2,400. Catamarans typically need some help going downwind. You can’t let the big roachy main out too far because it will run into the aft swept spreaders, and you can’t use the monohull trick of just bagging the main and polling out a headsail because the jibs are just too small. You can jibe downwind, sailing maybe 130 degrees off the wind but that adds a lot of distance to a passage. The best bet is to add a cruising spinnaker, which allows you to sail very deep downwind and keep your boat speed up. North Sails built a Norlon Gennaker with a snuffer to make it easy to handle. The sail has unique feature called a “gybulator,” which is short batten that projects forward from the tack of the sail to prevent the lazy sheet from dropping down below the sail. A gennaker doesn’t need to tacked to the centerline of the boat, so moving it to the tack fitting on either hull opens up the sail for better performance. The gennaker cost $4,155. There’s no doubt that the sails made up a huge chunk of the budget, but few things provide the kind of performance value for your dollar that sails do. The running rigging also suffered from UV damage. For main and jib halyards, we chose New England Ropes VPC, a vectran-cored line bulked up with polyolefin that also provides some cost savings over more sophisticated line. New England Ropes Sta-Set works really well for spinnaker halyards and the price is right. We used Sta-Set for the spinnaker sheets and tackline, too. The total cost for all the rigging was $1,500. The winches were pretty corroded, so I bit the bullet and bought some new ones. Luckily the boat makes pretty efficient use of winches, there are only two, one at the mast base and a multipurpose electric in the cockpit. I looked at the winch market and settled on the Harken Radial series, which offers standard and electric winches that can be used manually just by inserting the winch handle. For the cockpit winch, I opted for a manual Harken 46 two-speed Radial self-tailing winch for $1,500. The winch at the mast was the budget-buster: a Harken 40 electric self-tailing Radial winch. The winch, switch gear and wiring cost $2,900. There are three engines to maintain on the boat, two Volvo propulsion engines and the diesel in the genset. Luckily the engines were all in very good shape with low hours, and we wanted to keep them running well. Diesel engines are happiest with clean fuel and fresh oil, so it’s a good idea to do a full service on the engines of every used boat when you take ownership. I did just that on all three engines, replacing the oil, filter, on-engine fuel filter and primary fuel filter. This work cost $210 per engine, for a total of $630. Impellers have the tendency to fail at the most inopportune times, typically while coming into a new harbor, in the dark, while raining, in 25 knots of gusty wind. I prefer to eat the cost of the impeller and change them on my own terms, which is usually about once a year. Again, since it’s difficult to know when some maintenance has been done on a used boat, replacing the impellers straightaway offers peace of mind that’s well worth the cost. In this case, I spent $135 to replace the impellers on all three engines. The boat had electrical issues to contend with as well. The house battery bank refused to stay charged and the port starting battery also wasn’t up to snuff. I opted for all new batteries: four AGM batteries in the house bank and a new starting battery for each engine for a cost of $1,200. To keep the batteries topped off, I used a Balmar 70-amp alternator on each engine, combined with a smart regulator. Both of these alternators were tied to the house bank, and to keep the regulators synchronized and optimized I added a Balmar Centerfielder II. This charging gear came to a cost of $2,000. I also needed to bleed off a little charge current for each start battery, so I installed a couple Balmar DuoCharges. They allow you siphon off up to 30 amps of charging current while maintaining isolation between the banks. The pair of DuoCharges cost $475. Charging from the engines was taken care of, but it would be a sin to miss an opportunity to capitalize on solar power in a boat that will be primarily sailed near the equator. 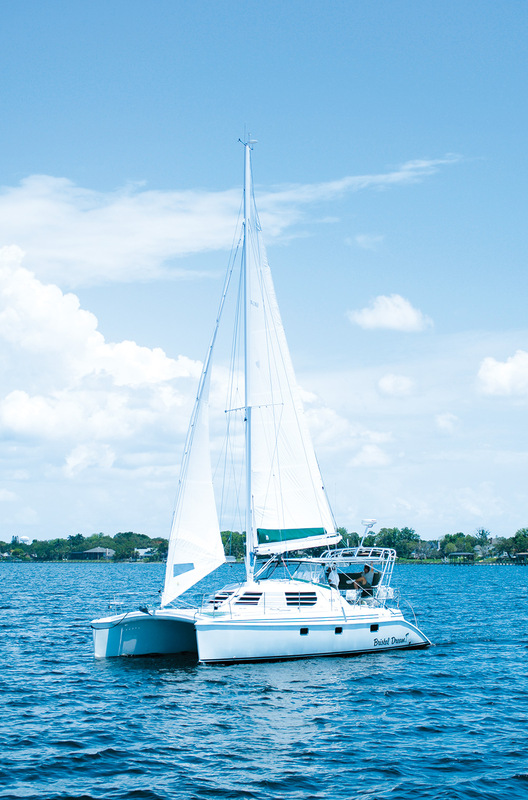 The Manta has a large fiberglass bimini that is the perfect platform for solar panels. The area is large enough for six 90-watt panels. In addition to the panels, I added an Outback FlexMax 80 charge controller to regulate them. The panels cost $1,400 and the charge controller was $525. With charging under control, I went after the consumption side of the electrical balance sheet. The boat had a collection of incandescent and CCF fixtures when I bought it, but I wanted to upgrade to LED. With LED the light quality is better and the consumption lower. It was easy to convert the incandescent fixtures over to LED with replacement bulbs, converting 10 fixtures for about $190. I also replaced the five fluorescent fixtures with LED for another $600. Next on the list was refrigeration. The boat came with an Adler-Barbour Cold Machine but it didn’t work well. I have had good luck with Frigoboat refrigeration systems on other boats, so I went with what I know. Frigoboat, like most companies, uses a standard Danfoss compressor and a thin aluminum evaporator plate, but their novel addition is the keel cooler condenser. Most refrigeration systems condense the coolant with air (a fan blowing over a heat exchanger) or water (seawater pumped through a heat exchanger), but Frigoboat has an option to loop the coolant outside the hull in a bronze “shoe.” It has all the benefits of water cooling (efficient operation at high ambient temperatures) but none of the drawbacks (drawing water into the boat is a hassle of managing leaks and clogs). I chose a large thin-plate evaporator, compressor, keel cooler and digital thermostat, the cost was $1,700. The boat also needed a good buff and wax. A catamaran has a surprising amount of real estate above the waterline; the freeboard is relatively high and there is tremendous amount of deck area so I broke down and hired out the buff and wax. At $2,200, it wasn’t cheap but it was huge time savings. The boat also needed bottom paint. The paint that was on it was in good shape, but there wasn’t much of the ablative paint left. After taking the lazy man’s approach on the topsides, I opted to do the bottom work myself, and started by sanding with 80-grit sandpaper on a random orbital sander while donning a Tyvek suit, gloves and a respirator. After sanding, I hosed off the bottom and let it dry completely. After a couple days I rolled on two coats of Pettit Ultima SR-40 onto each hull. It took five gallons of paint for the two coats. The paint and materials cost $1,150. It took a few months to complete the refit, but the projects checked off the list should offer years of use before we have to think about upgrading again. It wasn’t exactly a retrofit on a shoestring budget, but I still ended up with a solid 42-foot catamaran fit for serious cruising at a fraction of the cost of new.